The Rose UltraVista LC VWL-B122D is a 2x2 Video Wall Control which has 1 dual-link DVI input / 4 single-link DVI outputs. This video wall product allows you to produce a high quality, inexpensive video wall. Models are also available for a 1x4, or 3x3 video wall. The 2x2 and 3x3 models can be expanded to produce a 4x4 or a 9x9 video array. 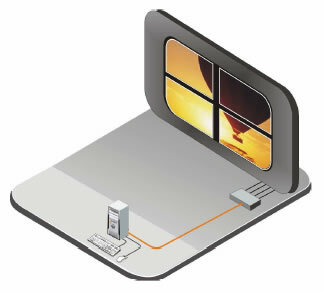 Connect the UltraVista LC directly to a laptop or desktop computer with a single DVI cable and instantly the hi-definition computer image is displayed on a large video wall. No extra set-up is required because the UltraVista LC automatically detects the correct settings. UltraVista LC requires a high resolution dual link DVI input from the video source. The video source is split directly over the display array with no image scaling or adjustments. Control of the UltraVista LC can be performed remotely using the remote control or from a connected computer with an RS232 serial port. The UltraVista LC can be automatically configured to produce three output modes; video wall mode, clone mode, and replication mode. These modes are automatically configured based on the input resolution received from the video source. The video wall mode accurately splits the input image over the display array. The clone mode displays the same image on all monitors. The replication mode shows the same image on each row of monitors. Compatible with most monitor that supports DVI input. Displays can be LCD, HD Plasma, DLP, Projectors, or others.